About a month ago I received my second shipment of gear from Experticity which I was to test out for their #ExpertGear program. I was so excited about the experience that I recorded a short Unboxing video and posted about it here. Now that my thirty days are up I think it’s time to write my full review. I received a pair of blue Altra Instict 3.5 running shoes in size 11. This is a neutral shoe with moderate cushioning, designed to be “light, fast and let the foot do what it naturally wants to.” The shoe weighs about 8.1 ounces and comes in three other colors. 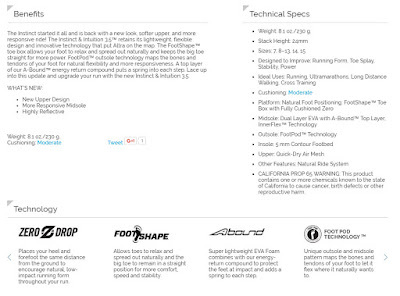 Below is a list of the specs and details taken from the Altra website. The Skinny: I need to admit, right off the bat that this review is based off of my specific use of the Altra Instict 3.5 shoe. As I stated in my short unboxing video, I am NOT a runner. I wore these shoes out walking, hiking, fishing and all around the office at work. Not your typical “runner’s review” but an honest review none the less. The FootShape toe box won it for me. Hits: Where do I begin? I think I will begin with the one thing this shoe does that I haven’t seen anywhere else and which made the most impact for me personally; The FootShape toe box. 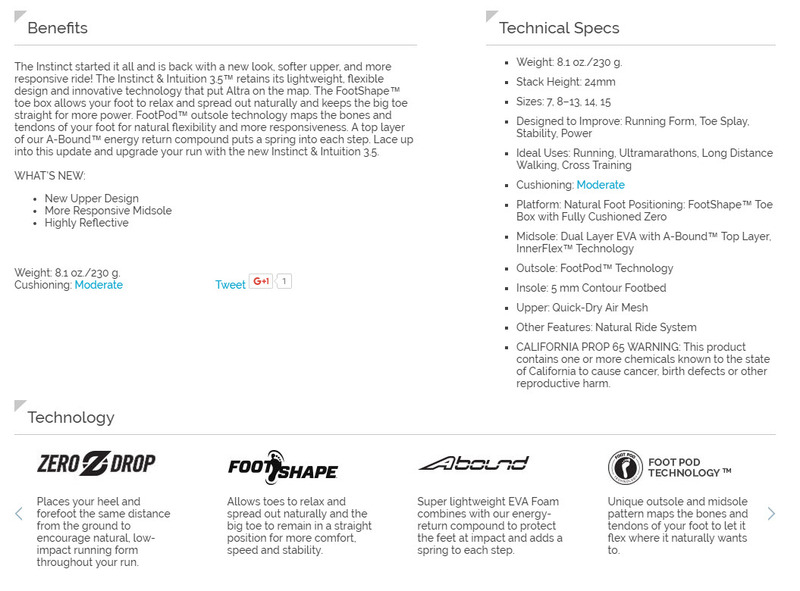 Altra does a great job explaining on their website why they created the FootShape toe box. But for me the reason I loved it is simple; Freedom. My toes didn’t feel cramped or constricted. They felt free for the first time in a shoe. Free like they do when I walk barefoot in the grass in the Spring and on sand in the Summer. It’s something you need to truly experience for yourself to actually understand it. It just FEELS RIGHT. Next up on the “hit list” is the Zero Drop design. Zero Drop, as I would come to find out, is a description of the distance which your heel and forefoot have compared to each other in relation to the ground. Typical shoe designs have a higher heel as compared to the forefoot. Not Altra. Your foot lays flat and is parallel to the ground, as nature intended it to be. After walking a lifetime in traditional shoes this is another feature which is difficult to explain without trying on a pair and comparing them to your regular shoes. As with the FootShape toe box, Zero Drop just FEELS RIGHT. Another benefit I found in the Instinct 3.5, which is a direct result of the FootShape toe box, is that the rest of the shoe is wider as well. I have a wider than normal foot as well as a very thick foot (the instep is elevated so that I typically have a difficult time with the tongue and laces not bulging). My foot felt right at home in the Altra Instinct 3.5. Misses: One of the only negatives about the Altra shoes I tested really has nothing to do with the Instinct 3.5 itself. I am traditionally a size 11 in men’s, which is the size I received from Altra and it fit perfectly. I loved the shoes so much I went out to find a pair more suitable for hiking, the Lone Peak 2.5. Upon trying those shoes on I learned the one negative. In the Lone Peak 2.5 I needed an 11.5 shoe. Not all of their shoes are sized similar. That’s a great feature for a shoe that is truly customized to each individual, but not so much for those of us who love to shop on the internet. Who wants to have to return a shoe that doesn’t fit? But then again, it would probably serve better to go into an actual retail store and try these shoes on every time. You start to learn the nuances that make each unique. Ideal for: Anyone who cares about their feet. Also this is ideal for minimalists or runners who believe in natural running. Bonus: If you love to run, Altra has some Youtube videos about how to properly run in your new Altras. Check them out below. Even if you aren’t interested in running, the same features I loved can be found in all their other types of shoes from trail running to stability to everyday use.